Part 44 of Wonders of World Engineering was published on Tuesday 28th December 1937, price 7d. 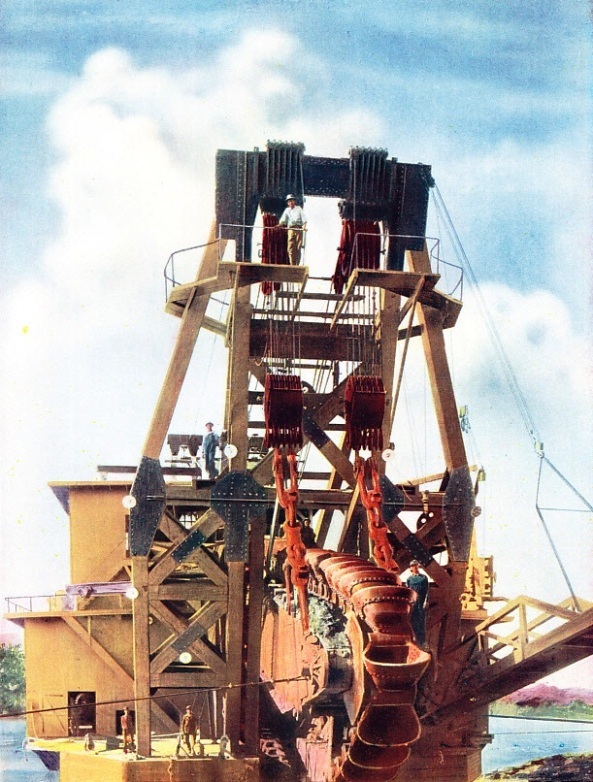 Part 44 includes a colour plate showing one of the largest gold dredges operating in North America. It formed part of the article on Gold-Dredging Machinery. 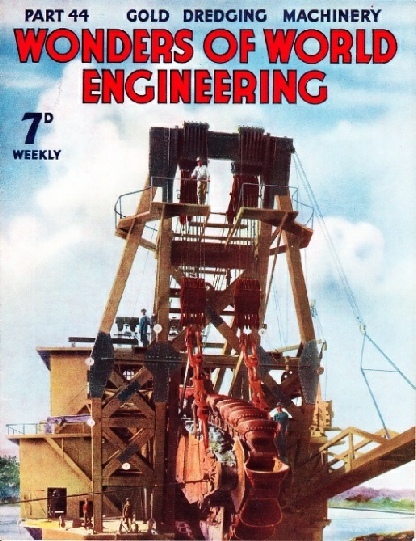 The cover this week is reproduced as a colour plate; the original photograph was supplied by courtesy of Ruston-Bucyrus Ltd. It shows the front end of one of the great gold dredges operating in the Western States of North America. Gold-bearing soil and gravel are brought up on an endless chain of buckets, as described in the chapter which begins on page 1257. One of the most valuable tests of the efficiency of an engine - whether a reciprocating steam engine, a steam turbine or an internal combustion engine - is the measurement of its horse-power. Horse-power is measured by dynamometers of various kinds. 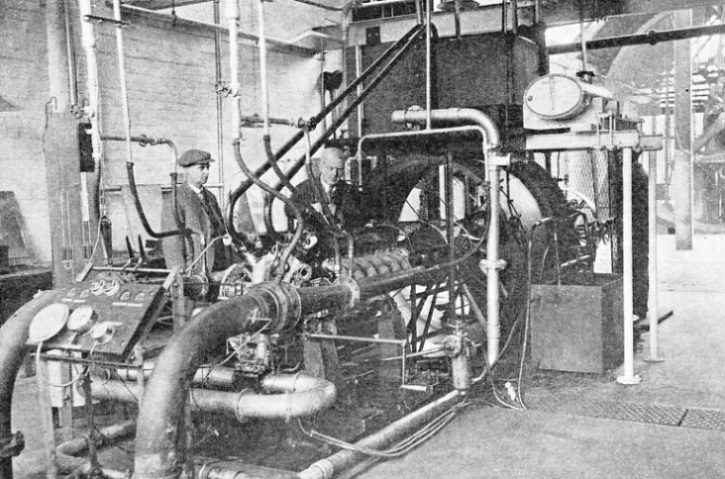 Edwin Judd contributes this chapter dealing with the testing of steam and oil engines. The power of an engine is measured by some form of brake dynamometer. Dynamometers vary in size and in detail, but the principle is virtually the same in all instances. This chapter explains how the dynamometer gives and accurate indication of the power of an engine. AIRCRAFT ENGINE ON TEST. The Rolls-Royce Kestrel supercharged engine illustrated has twelve cylinders. On the ground it develops about 785 horse-power at 2,500 revolutions a minute. Crank speeds up to 3,000 revolutions a minute are permissible. The testing of internal combustion engines involves many factors not present in steam engines, but all the power developed may similarly be measures by a brake or hydraulic dynamometer. The story of the world’s water speed record, by L H Thomas. The article is concluded from part 43. Although the nature of wireless waves was not unknown when Marconi started his experiments; it was he who made practicable the use of their properties. The enormous value and scope of radio transmission to-day has been developed from his brilliant discoveries and untiring research. Any passer-by at Signal Hill, Newfoundland, on December 12, 1901, might have been excused for thinking that the man to be seen there flying a kite was simply attempting to repeat Benjamin Franklin’s famous experiment of some 150 years earlier. The two experiments had two things in common. Both were made in the hope of obtaining an electrical discharge from the upper regions of the air, and both were successful. Franklin proved by his kite-flying that the awe-inspiring lightning flash was of the same nature as the spark from the Leyden jar. Marconi showed that an infinitely smaller discharge could be sent across the ocean in a curved path and made to report itself 2,000 miles away. To-day a commonplace radio transmission over such a distance was then considered to be impracticable by so many people that Marconi hesitated for two days after the experiment before he sent a cablegram to England announcing his achievement. The story of the early days of Guglielmo Marconi is not one of contention with adversity. He was born at Bologna on April 25, 1874. His father was an Italian country gentleman and his mother, to whose faith in him the boy later owed much, was an Irish lady of good family. Nothing notable is recorded of his childhood, nor of his schooldays, save that he was keenly interested in physical and electrical science. His youth was spent at an Italian University and he was 21 before he began to concern himself seriously with what were then known as Hertzian waves. It is quite wrong to assume, as so many people do, that Marconi discovered “wireless” waves. Long before him the British physicists James Clerk-Maxwell and Sir William Crookes had predicted their existence, and in 1886 the young German Hertz was able to demonstrate it. Sir Oliver Lodge also produced wireless waves, but he used them in demonstrations only, as did some others. Among these were Professor E. Branly, of Paris, who devised the well-known “coherer”, and the Russian, Professor A. Popoff, who first used this device in detecting electromagnetic waves derived from the lightning flash. Marconi's place in the history of engineering is secured by the fact that his genius enabled him to foresee the possibilities of, and to bring to pass, the harnessing of the waves so that they could be used to convey messages over distances of thousands of miles instead of merely announcing their presence to an apparatus a few hundred feet away. 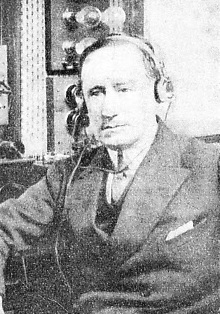 Marconi, when he turned his attention to the subject in 1895, soon discovered that he must improve the receiving instrument and he set to work on the Lodge-Branly coherer. This he altered until it would transmit sufficient incoming current to operate a relay. Then he invented an automatic tapping mechanism to restore it to the non-conducting condition required for the next set of waves. He had already increased the transmitting capacity of his spark-gap resonator by earthing one of its spheres, an arrangement which had not occurred to his predecessors. He next discovered that the ranges of transmission and of reception were improved by increasing the height of the aerial. These three inventions were covered by a British patent in 1896, when Marconi came to England and was fortunate enough to secure the interest of the Engineer-in-Chief of the Post Office. This was Sir William Preece, who, years before, had, with A. W. Heaviside, signalled across a space of ten miles, by using parallel telegraph wires, and had performed other notable experiments. Having been given permission to demonstrate his apparatus at the General Post Office, Marconi speedily proved its efficiency across London. He then did the same thing on Salisbury Plain and across the Bristol Channel. The Italian Government gave him permission in the following year to test the system between Spezia and a warship twelve miles away. Commercial success followed, and a company was formed. By 1901 there were several short-distance transmissions in England, for example between the mainland and the Isle of Wight and installations on the East Goodwin Lightship and the South Foreland Lighthouse, in Kent. Then came the erection of the station at Poldhu in Cornwall, with its circle of masts each 210 feet high. From this station were sent the historic signals, at first the three dots of the Morse “S”, caught on a kite 400 feet above the ground and 700 feet above the raging sea below the station in Newfoundland. The coherer of filings was later superseded by the crystal detector, which, by allowing waves to pass in only one direction, converts oscillations into pulsations capable of producing audible speech in an ordinary telephone. This in turn was displaced by the thermionic valve of Fleming and its modification by De Forest and others. Ennobled by the land of his birth, honoured in countless ways in Great Britain and in other countries, the Marchese Marconi, GCVO, spent a busy and useful life until death came to him on July 20, 1937. This is the fifteenth article in the series Makers of Engineering History. THE ENDLESS CHAIN OF BUCKETS in a Californian gold dredge will bring in as much as 500 cubic yards an hour of gold-bearing gravel from depths as great as 100 feet. Each of the buckets of the dredge illustrated weighs 1,750 lb and has a capacity of six cubic feet. CONTROL SWITCHBOARD for a totalisator installation at a greyhound racecourse. 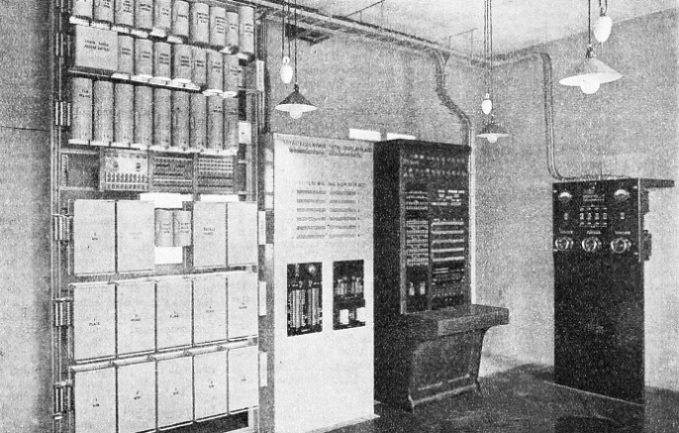 The small switchboard near the centre of the illustration controls the operation of the entire apparatus. Keys on this board control signal lamps at the ticket issuing booths; other keys lock the apparatus electrically; and switches, controlled by a lock, start and stop the operation of the whole totalisator. 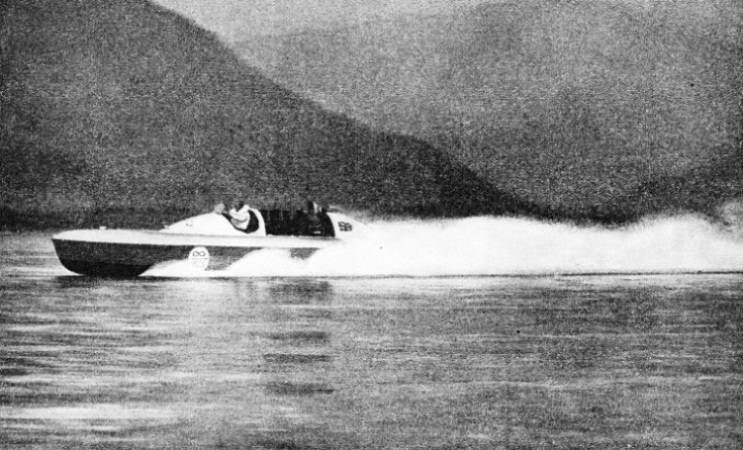 A FAST RUN ON LAKE MAGGIORE, on the smooth surface of which Blue Bird eventually attained a speed of 130·43 miles an hour. The above illustration shows the boat with her streamlined tail in position; this tail was removed during the record run, as it was necessary to modify the water-cooling system and to discharge the water at the stern of the boat. ENDLESS CHAIN OF BUCKETS on one of the largest gold dredges operating in the Western States of North America. Each bucket has a capacity of 15 cubic feet, and weighs about two tons. The buckets are strongly built, being fitted with lips of special steel. There may be as many as a hundred buckets on the chain. Sometimes masses of rock come on board in the buckets and the machinery has to be stopped while the rock is rolled overboard again. This colour plate is also reproduced on the cover of this part. The gold-bearing valleys in the Western States of North America are dredged by machines each of which may cost as much as £100,000 to build. The dredges recover enormous quantities of gold, and they are able to work in waterlogged soil where mining operations are impossible. A colour plate accompanies this article, showing one of the immense gold dredges which are used in the gold-bearing valleys of California. The great machines, and their methods of operation, are described in this chapter by T C Bridges. In various parts of the world there are outstanding examples of the skill of craftsmen thousands of years ago. The pyramids and obelisks of Egypt, the stone circles at Stonehenge and the mysterious statues of Easter Island are among the timeless monuments of bygone ages. Over the north door of St. Paul’s Cathedral, London, is the famous epitaph of Sir Christopher Wren: Si monumentum requiris, circumspice - “If you seek his monument, look about you”. These words would be a fitting epitaph for all the great engineers who have built structures, such as the Forth Bridge and the Panama Canal, for instance, which will long outlast their designers. All the great engineering structures of the world are lasting monuments to the engineers who built them, and in the world to-day there are many monuments to the unknown engineers of past ages. Take, for instance, the Great Pyramid, in Egypt. It is so old that even its date cannot be determined exactly, yet it must have been planned and built with extra-ordinary science and skill for it to have lasted for so many thousands of years. 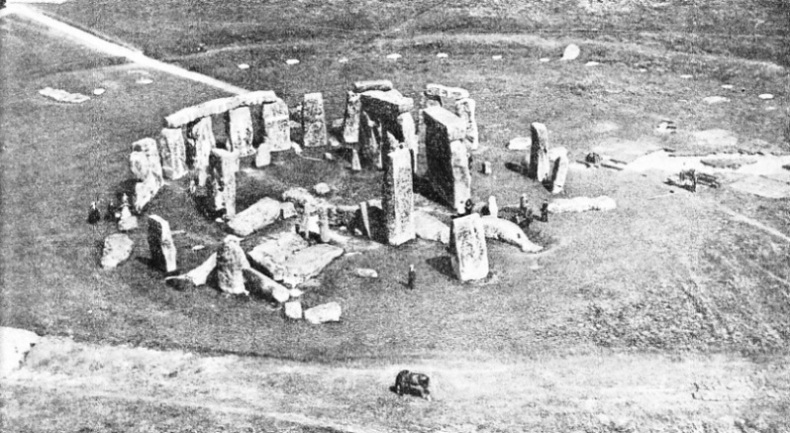 The famous stone circle known as Stonehenge, on Salisbury Plain, in Wiltshire is another remarkable example of works lasting for so long that the methods of their construction have become a matter of controversy. These and other famous examples of what may be described as monumental engineering are the subject of this chapter contributed by Lieut.-Com. Rupert T. Gould, whose chapter on the Eiffel Tower in Part 41 described one of the best modem examples of this kind of engineering. His chapter covers a large field, for he discusses matters ranging from the monuments of ancient Egypt and the extraordinary statues on Easter Island, in the Pacific Ocean, to more recent examples of monumental engineering in Russia, France, Great Britain and the United States. THE STONE CIRCLES of Stonehenge, on Salisbury Plain, Wiltshire, were erected thousands of years ago. The outer ring of stones has a diameter of 108 feet and consisted of thirty huge monoliths with lintels mortised to them. Sixteen uprights and five lintels remain. The white patches in the background mark the site of the stones of a now vanished outer circle. The inner circle of monoliths originated in South Wales; these stones were probably brought to Wiltshire by water as far as Amesbury. The story of the Quebec Bridge is a story of triumph after disaster. On two occasions thousands of tons of steel collapsed and fell into deep water. Undaunted, those in charge persevered and completed an invaluable link in transcontinental communications. North America was the scene of one of the finest epics in the history of bridge building. Quebec Bridge, which spans the St. Lawrence River, took seventeen years to build. On two occasions disaster overwhelmed the structure, but in face of tremendous difficulties the engineers finally completed the bridge. In 1907, when work had been in progress for seven years, 17,000 tons of steel collapsed, some falling into the river, which is here 200 feet deep, and the rest crashing on the pier and on the bank in a fearful tangle of twisted plates and girders. Years passed before the damage could be repaired and the work finished. 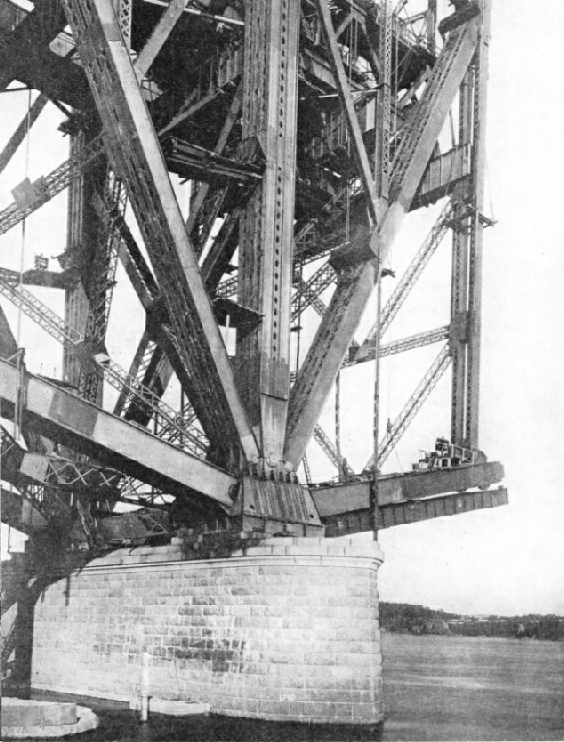 By 1916 the cantilever arms and anchor arms on either bank were completed and the bridge was ready for the erection of the centre 640-feet span. This was floated into position and raised to the level of the cantilever arms by hydraulic jacks and lifting appliances. The job was nearly finished when without warning the great span, containing 5,000 tons of steel, broke away and fell into the deep water. A new span had to be built, and in September 1917 the bridge was at last finished. 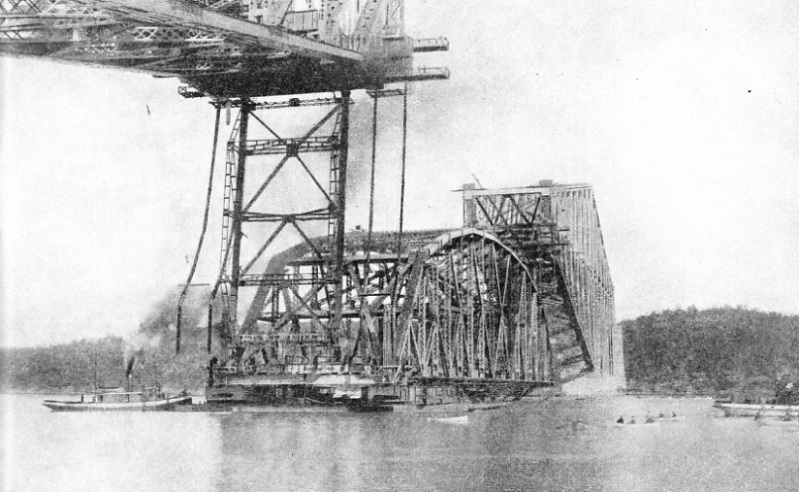 In this chapter by Sidney Howard, is described the building of Quebec Bridge. This chapter is the fifteenth in the series on Linking the World’s Highways and the article is concluded in part 45. PREPARING TO RAISE THE CENTRAL SPAN of Quebec bridge. While the enormous cantilever arms of the bridge were being built, the central span was being assembled at Sillery Cove, about 3½ miles away. The span was 640 feet long and the arched sides were 110 feet high in the middle. The span was floated to the site on massive steel pontoons. The skill of the electrical engineer and the experience amassed by the telephone engineer have made possible the design of a complex instrument to which vast sums of money are entrusted every day. Although electric totalisator machines are seen only at racing tracks, they are amazingly complex structures of the greatest interest to engineers. This chapter is by Howard Barry. THE NORTHERN PIER of Quebec Bridge, with steelwork being prepared for the hoisting of the central span from floating pontoons. For building the pier an immense caisson was used, 180 feet long, 55 feet wide and 68 feet high. 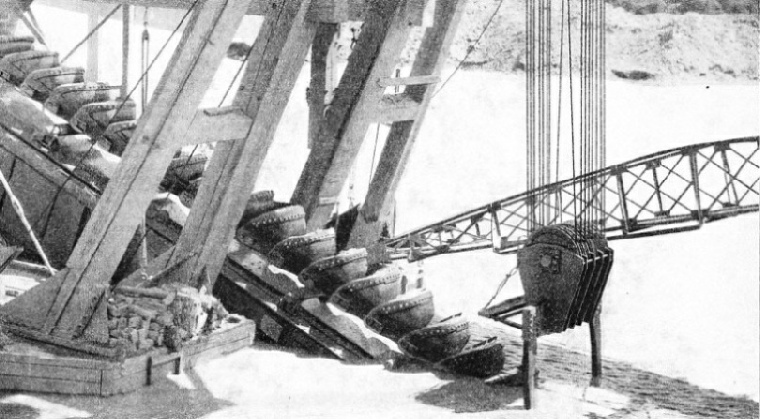 Excavation and sinking of the caisson were carried out continuously, day and night, and the caisson was filled with concrete at the rate of 1,000 cubic yards a day. The depth of the pier is 101 feet below high water and the vertical post of the tower resting on the pier is 310 feet high.